Enjoying the beautiful September warmth and sunshine with a morning of birding. This weekend turned out to be a weekend filled with a few of my favorite things. First on that list was a morning of birding. Rob and I headed Whitby way Saturday morning to check out some local hot spots. I haven't done a lot of birding the last couple months due to the heat and the mosquitoes, so it felt good to be out, binoculars in hand. It was a good morning too. Saw lots of Hummingbirds fueling up for their trip south. 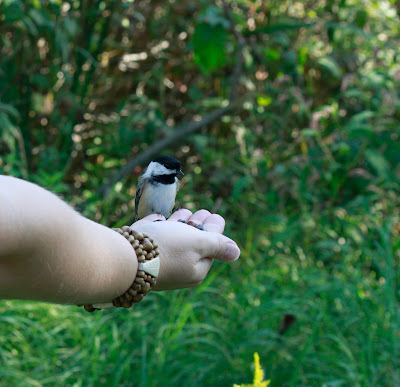 I had a Blue Jay and Chickadees land in my hand for seed. 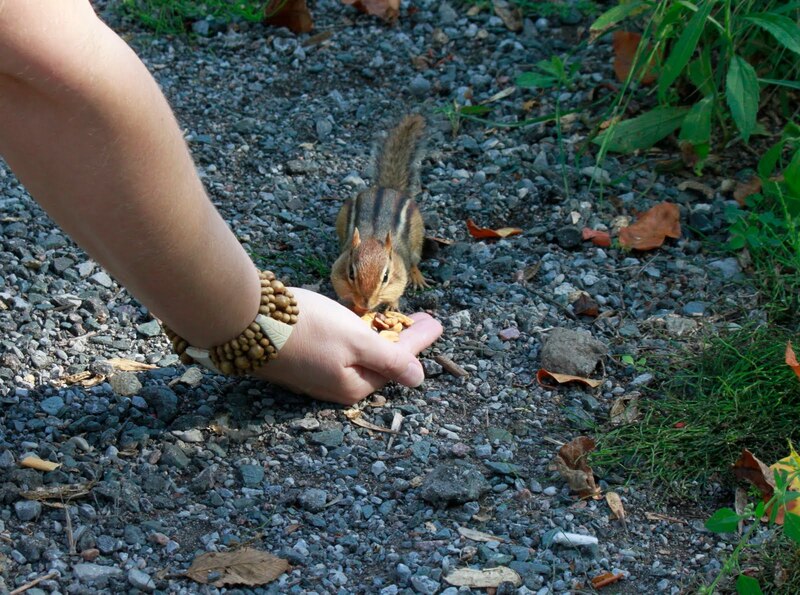 Three chipmunks dancing around my feet for food was quite entertaining as well. I never tire of hand feeding Chickadees. Lots of chipmunks were around Saturday morning looking for a hand out as they stock up for winter. Saturday evening we went to one of our favorite restaurants, "Lucy's Seafood Kitchen" in Mississauga with our friends Jim and Lynda for an early birthday celebration for Rob. Jim handed a rather large box wrapped in a seed bag from their bird store when we got out of the truck, which turned out to be a bottle of Rob's favorite Whiskey, "Forty Creek". We all enjoyed our meals, conversation, and their famous Peanut Butter Pie for dessert amidst a lot of laughs. Enjoying an evening out with our friends, Jim and Lynda. One of my very favorite things, Oysters!! Oh, and the "Hurricane" drink isn't bad either. Me and my sweetie, he's my most favorite thing of all!! Sunday morning I met up with two of my girlfriends for a late birthday celebration. We took the subway together downtown to "MoRoCo" for a fabulous brunch. Any place that gives you chocolate with your coffee is 2 thumbs up in my books! We all thoroughly enjoyed our food and time there, and discussed a return visit, soon. Jenn loved her "Breakfast Fondue". This "Kiss Me Kate" red velvet cake is definitely a favorite! Time spent with girlfriends is ALWAYS a favorite thing. 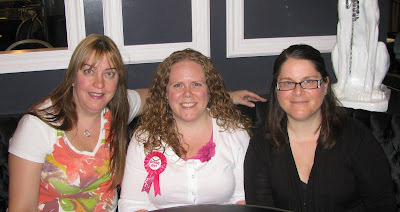 After a quiet and relaxing weekend last weekend, it was nice to get out and spend some time with friends. The Kiss Me Kate looks delish! Beautiful pics of everyone. Looks like a wonderful brunch. Have to remember that place in the future. How is their afternoon tea?